LAMBRECHT meteo is a young and dynamic company that has been outsourced in 2015 from the traditional Wilh. Lambrecht GmbH. Behind this stands a team of dedicated and competent employees and experts that is active in the market of meteorological measuring technique since a lot of years. Our core competences are wind and precipitation measurement: in these fields we offer solutions and measuring systems that are state-of-the-art and real technological innovations at the same time. Products of the LAMBRECHT meteo GmbH are in operation where parameters like wind, rain, temperature, and others have to be measured. Users from weather services and branches like wind generator manufacturers, building control, system integrators and shipbuilders are trusting in LAMBRECHT equipment since many years. 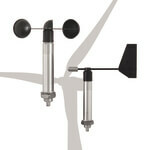 LAMBRECHT meteo can also provide further peripheral instruments and accessories. Data loggers and software packages allow a comfortable and easy use. Among others the data can be transferred by means of different telemetry modes e.g. in the internet. Substantial service packages in combination with a long lasting supply of support and spare parts distinguish the LAMBRECHT meteo GmbH as a reliable supplier. PRO-WEA is the universal genius with improved protection against electrostatic discharge. This makes these wind sensors predestined for use in areas at risk of lightning. The Modbus RTU interface simplifies the integration of the professional wind speed and wind direction sensors into networks and allows the construction of long communication distances.